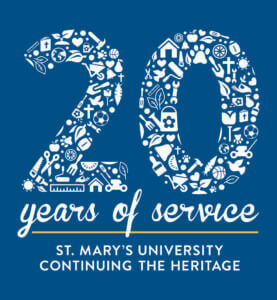 Since the Continuing the Heritage day of service began in 1997, about 15,000 St. Mary’s University volunteers have offered more than 50,000 service hours to organizations that provide much-needed assistance to South Texas residents. Twice a year, Continuing the Heritage brings together students, faculty, staff and alumni to volunteer for community projects, such as graffiti abatement, gardening, packaging and delivering food and clothing for the poor, and working with children and animals. On Saturday, Aug. 19, about 700 volunteers – mostly college students – will walk dogs, pack produce, swing hammers, and do other good deeds for the fall event. Online registration begins Monday, Aug. 14, at https://stmarytx.givepulse.com. Catholic Charities at 1801 W. Cesar E. Chavez Blvd. Volunteers will create space for incoming food, then unload, sort and stock food. at 1111 Culebra Road. Volunteers will assist with a community garden. San Antonio Food Bank at 5200 W. Old US Highway 90. Students work together to sort and/or pack produce, nonperishable foods and household items, preparing them for distribution. Haven for Hope at 1 Haven for Hope Way. Students will help clean mats for people staying in prospects courtyard. The DoSeum at 2800 Broadway. Students will support the engagement of guests in the galleries. They will also help support the “Share the Love” program. Dream Center at 2903 West Salinas St. As many as 75 volunteers will walk the neighborhood cleaning yards, covering graffiti and doing minor home repairs. For more information, contact Civic Engagement at 210-436-3102 or civicengagement@stmarytx.edu.